Here's Francesca modeling the wide collar. That's about all she'd do because she was too busy sun bathing! Remember when I was so excited about the dog tag clip? I was excited because it meant MORE COLLARS FOR ME! I like to wear decorative collars. I always get compliments when I do. 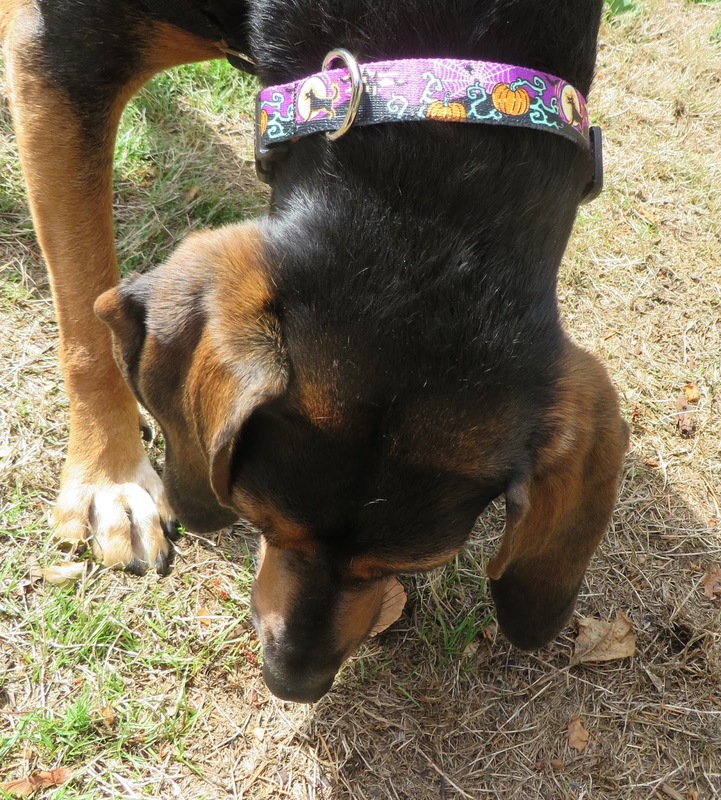 So recently I tested out some Halloween collars because that is the next holiday that is coming up. And also because, as you know, I LIKE TREATS! Francesca tried one too but she's too lazy to write a review. I think I deserve her treats! 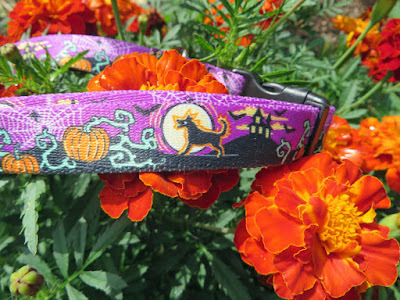 The website where you can get holiday themed collars, leashes and more is Dog Collar Boutique. We were sent two Halloween collars to try. One was 1 inch wide and the other was 3/4 inch wide. So you can see that they will fit little dogs and big dogs too. But what I liked about these collars is that they were COLORFUL. When I go Trick or Treating, everyone will see me. Here I am modeling the purple collar. So what are they made of? The collars are made of 100% dye-sublimated durable polyester, colorfast and machine washable. The designs are printed with a special heat transfer process onto a heavy braid. The collars we checked out had heavy duty plastic clasps and metal D rings. Now they aren't really for any heavy duty work, but in a pinch, you can attach a leash to them. I think they are best for looks.... and they look great. Best of all, they are made in the good ol' USA! The widest collar had Trick or TREAT written all over it plus some scary cats, ghosts and witches. The smaller collar had DOGS howling at the moon. Now I liked that a lot. I have to tell you, although I am not happy about it, that the Dog Collar Boutique also has collars for CATS. OMG! So here's some pictures of our collars. Have a look at the website because they have all kinds of collars and things. Team collars, holiday collars, designs and so much more. It's a great site to peruse on a rainy day! Here's a close up of the wider collar showing the sturdy plastic clasp. Here's the purple collar with the howling dogs. Cool! So now I think I'll do some shopping for Christmas collars! If you want to get some Halloween gear, you can find it at Dog Collar Boutique. Love your snazzy purple collar!! Wordless Wednesday: Does Francesca Study Yoga? I've Been Hacked: Francesca is suspended!